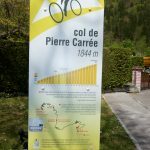 Col de Pierre Carrée (1844 metres) is the highest paved pass open year-round in the north French Alps (Haute Savoie & Savoie). It is the gateway to Flaine ski station 4 kilometres down the far side. 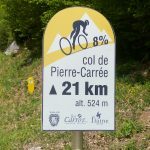 While not very well known, it’s a big climb, comparable in length with more famous French climbs – if a little less steep. The Tour de France has never climbed this mountain, although in 2009 it managed the first seven kilometres (Côte d’Arêches). The first half of the climb can have a little bit of traffic, but it’s interesting enough. 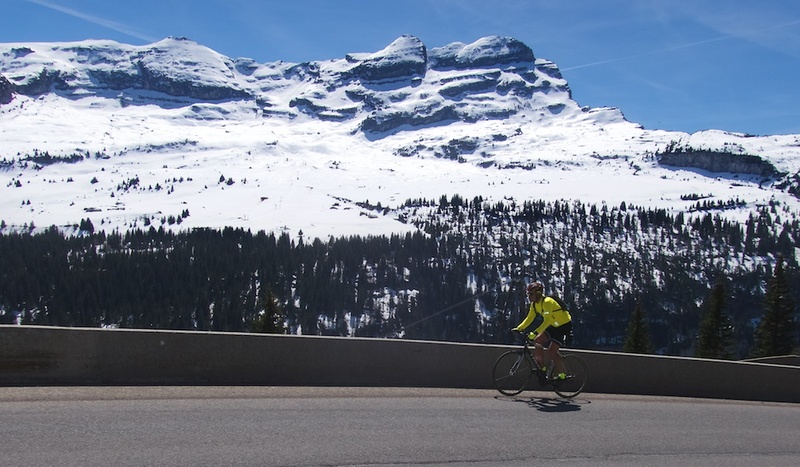 But above Les Carroz – outside of ski season – the top half is very quiet. Even in summer, the resort is near deserted. At the Col is a small golf course. In winter it’s a small but very scenic groomed cross-country ski area. 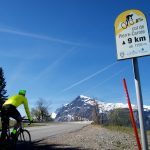 If you still have some energy, it is only 4 kilometres down the far side to Flaine ski station – a dead-end (on road bike at least). 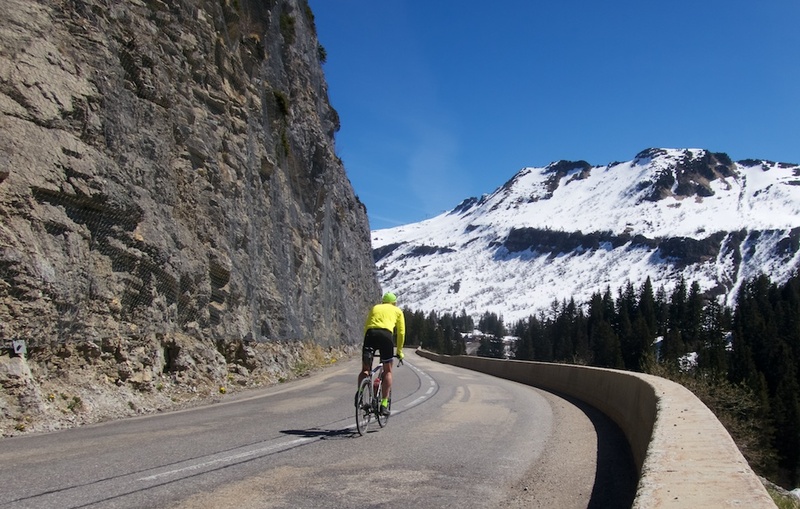 It’s a fun four kms and there was plenty of snow in view due to the north facing – now closed – ski slopes. In summer, some of the best, and highest north-French-Alps mountain biking is possible here. 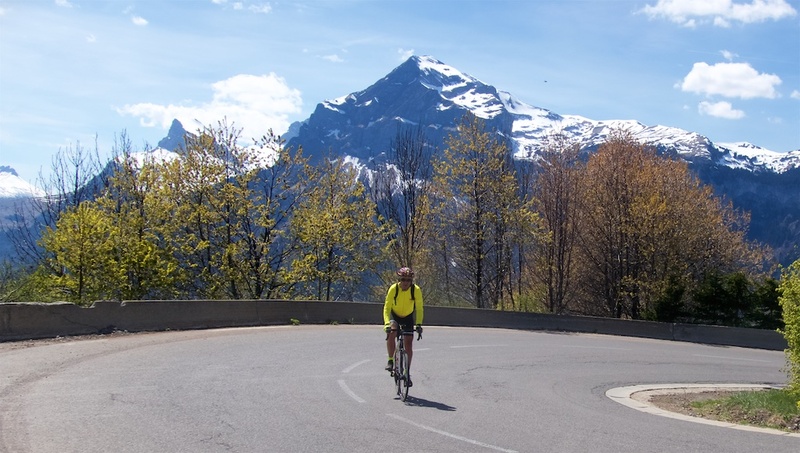 There are several beautiful unpaved cols and its possible to get all the way to Les Grandes Platières (2480) metres in the face of Mont Blanc. See here for a 5 col loop up. Or see here for another excellent high mountain bike loop. 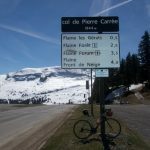 In summer, mountain bike to Les Grandes Platières (2480m). It is the highest I have been on mountain bike this close to home. Mont Blanc behind. Hi Will. 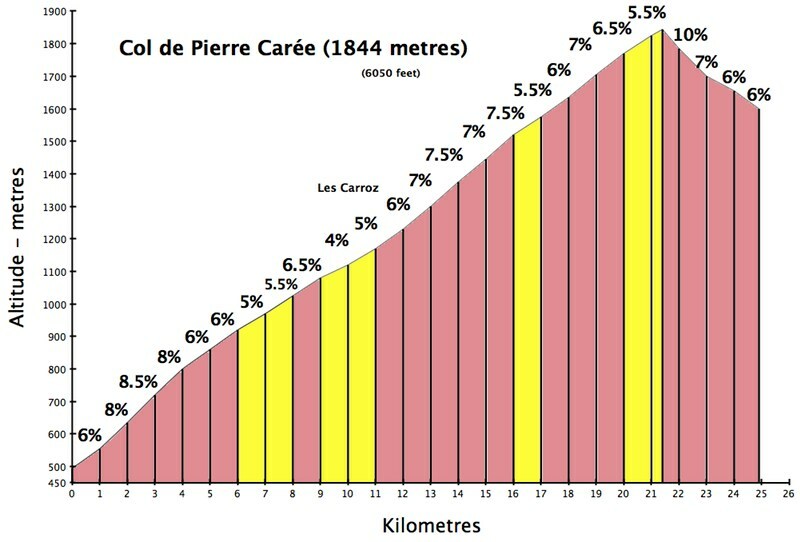 Just to complete the story, I did manage to ‘everest’ the climb between Les Carroz and Pierre Carrée, last Sunday. It needed 12 and a bit reps and 18 hours of moving time but I think it was a very good choice of climb – so thanks for your help and advice. Vince, congrats! That’s a huge achievement.